↑ WWE (February 11, 2016). 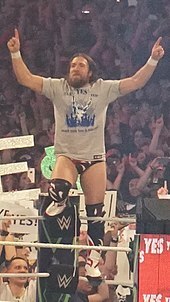 «Daniel Bryan's final match: Daniel Bryan & John Cena vs. Cesaro & Kidd: SmackDown, Apr. 16, 2015». Consultado el 19 de octubre de 2016 – via YouTube. ↑ Meltzer, Dave (February 15, 2016). «February 15, 2016 Wrestling Observer Newsletter: Daniel Bryan retires». Wrestling Observer Newsletter (Campbell, California): 1-21. ISSN 1083-9593. ↑ «thebriebella Instagram». Instagram. Consultado el June 24, 2016. ↑ a b c «2013 Slammy Award winners». WWE. December 8, 2013. Consultado el March 21, 2015. ↑ a b «WWE News: Full list of 2010 Slammy Awards, 10 announced on WWE's website». Pro Wrestling Torch. December 13, 2010. Consultado el December 17, 2010. ↑ a b Laboon, Jeff (December 8, 2014). «2014 Slammy Award winners». WWE. Consultado el March 21, 2015. ↑ a b c «Slammy award winners voted by WWE.com». Wrestling Observer Newsletter. December 16, 2012. Consultado el March 21, 2015. ↑ a b Caldwell, James (December 9, 2013). «WWE news: Complete list of "Slammys" winners during Raw». Pro Wrestling Torch. Consultado el March 21, 2015. 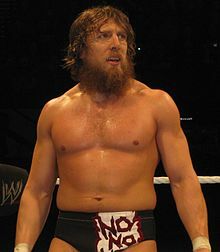 ↑ «2012 WWE Slammy Awards and WWE.com Slammy Awards winners». WWE. December 16, 2012. Consultado el March 21, 2015.